Organizzato dal Dipartimento di Studi Umanistici dell’Università di Torino e dal Museo del Paesaggio Sonoro di Riva presso Chieri, in collaborazione con il Dipartimento delle Arti dell’Università di Bologna. Folk Cinema officially born in 1980 as Mario Calderaro. After a long academic education he decided to continue to work independently on the concept developed first during the BA thesis in Ethnomusicology and then during the PhD research in Anthropology of Sound: the sound-image (l’immagine-suono), a development in acoustic terms of Deleuze’s ‘image-time’ and Lacan’s unconscious system. Actually he’s deepening his training as a gardener, keeping on making films and working as a free-lance sound-designer for theatre, cinema and art-installations. Whereas Folk Cinema regards audiovisual compositions developed around common authorial instances in accordance to sound-image’s theory, that is an attempt to reach unconscious processes basing a cinematic experience on sound’s structure. So that Folk Cinema is not really “someone” but rather a “somehow”, a method. Folk Cinema – Vyana is a short documentary shot in the centre of Sicily, in a rural area with a rural topic: time and animality. It is a visual piece about an old woman, widow, attending to the shearing of the sheeps and working to the ancient loom. The video is arranged on a sound composition – defined sound-image – that holds it and works as a puzzling comment, predicting what happened after the movie was completed. Actually, a member of the woman’s family, in a critical moment, forced the signing of a paper where the informants are supposed to approve each screening in the future. 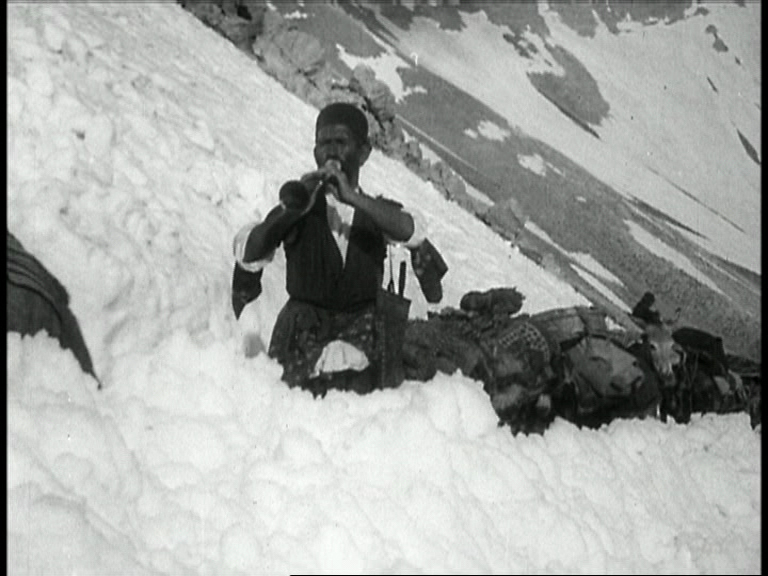 But the woman, by virtue of Folk Cinema’s frame, results as author and owner of the rights of the movie at the same time. Indeed, being Folk Cinema a creative attempt to solve the unequal relationship between informants and researchers in the ethno-anthropological field, sacrificing the property as the researcher’s dominance, the infringement of that paper aims to be intended as a ‘moral’ imperative since any advantage seemed to come by honesty and by the trust of an old friendship. Both the sound-image’s concept and the Folk Cinema frame will be discussed during the panel. Yves DEFRANCE is professor for ethnomusicology at the Centre for Breton and Celtic Studies at European University of Rennes, France. He is both generalist in ethnomusicology in several issues and fieldworks and expert about French Folk Music and French Ethnomusicology. He has published around 90 scientific articles and is used to give papers in international seminars as by ICTM World Conferences and Study Groups as well. He has also published 14 books as author or as editor and cut more than 40 audio-visual documentaries (CDS and movies) about France (Alan Lomax collection, 2002), Indonesia (2003-2012), Vietnam (VDE-Gallo, 2006), Kerala-South India (2007 & 2015), Japan (2008), North-eastern Brazil (2008), Peru (2009), Bolivia (2010), Laos (2010), Argentina (2011), Morocco (2012), Louisiana (2013), Cambodia (2014), Cuba (2016). He has been elected as chairman for the French Society for Ethnomusicology (Paris: 2006-09). He is also co-founder and co-director of the collection Anthropologie et musique by the editions L’Harmattan, Paris and has founded, with Luc Charles-Dominique, the CIRIEF (Centre International de Recherches Interdisciplinaires en Ethnomusicologie de la France). With international scholars including Yoshitaka Terada, Barley Norton, Leonardo d’Amico and others, he has founded the ICTM Study Group «Audiovisual ethnomusicology». Audiovisual tools in ethnomusicology: problems and paradoxes. The use of audiovisual tools in ethnomusicology begs a lot of technical and ethical questions including the way of telling a story, the picture’s polysemy, how to restore a musical practice, etc. After tracing shortly the main stages of audio-visual communication Yves Defrance focuses on showing the issues for video in the transmission of the real as it is received by the actors themselves. What are the limits between the reality and the symbolic construction of oral traditions, by definition, intangible? The presentation will be illustrated with some solutions that have been experienced in his own films made in different parts of the world during the last forty years. Jennie Gubner is a visiting Lecturer in Ethnomusicology in the Department of Folklore and Ethnomusicology at IU, Bloomington. She holds a PhD in Ethnomusicology from UCLA were she specialized in popular music as a vehicle for social change in South America and Southern Italy. Her research interests involve visual and sensory approaches to ethnography through multimodal scholarship and filmmaking. Her doctoral research uses film and writing to explore the politics of participatory music making practices in neighborhood tango scenes in Buenos Aires, Argentina. More recently, her research has taken her towards an applied pedagogical project that trains students to make personalized iPod music playlists for elders with Alzheimers and Dementia and to document these experiences through filmed ethnography. This talk will begin with my experiences as an ethnographer, violinist, and filmmaker in the late-night neighborhood tango music scenes of Buenos Aires. It will end with a discussion of a collaborative project developed with my students and the residents of dementia and Alzheimer’s units in nursing homes in Maine and Indiana in the United States. I will use these contrasting field sites to frame a broader discussion about filmmaking as a critical methodology for experiential ethnographic knowledge production. Through a discussion of how I film, edit, and circulate my work, I will argue that experiential filmmaking can be theorized as an activist mode of contemporary ethnomusicological research. In particular, I will focus on how I use filmmaking, and especially the making of engaging short films, to create research that is accessible inside and outside the walls of academia. In this regard, I will speak about the many lives some of my films have had and the value of multimodal ethnographic work in the age of social media. Whether advocating to bring visibility to local tango scenes overshadowed by tourist industries in Buenos Aires, or for the value of music as a critical (and non-pharmacological) intervention for elders with Alzheimer’s, my work filters applied ethnomusicological questions through a visual and sensory ethnographic lens. Matías Isolabella is assistant professor at the Department of Musicology at the University of Valladolid and Invited Professor at the University of Minho (Portugal). He specialises in ethnomusicology and audiovisual ethnomusicology. Raquel Jiménez is assistant professor at the Department of Musicology and Head Researcher, of the European Music Archaeology project at the University of Valladolid. She specialises in music archaeology, ethnoarchaeology and musical heritage. Clay drums are the most common musical instrument in Morocco and are a key element of Moroccan identity. They are frequently found in households and take part in some of the most important private celebrations, but they are also present in an enormous variety of musical contexts and in diverse musical styles. From small drums of only some centimetres high, such as little children taʾrīja for achoura, to the large harrāz of the Ḥamādcha, the drums are mass produced and sold in millions every year. A traditional pottery workshop is able to produce around two thousand instruments every fortnight, reaching an impressive number of approximatively forty thousand per year. Archaeological, historical and ethnographical sources show a noteworthy continuity in the significant role of clay drums among Islamic communities of the Western Mediterranean. They were very common in Islamic Spain but completely disappeared after the Christianization of these territories. What began in 2016 as a research with a clear ethnoarchaeological approach aimed to understand past musical behaviours and to explain the extinction of this instrument in the Northern side of the Gibraltar strait, led us to a comprehensive research and documentation of the contemporary mass production of pottery drums. Marco Lutzu is a postdoc scholar in Ethnomusicology at the University of Cagliari and adjunct professor in popular music studies at the University of Florence. He gained his PhD in ‘History and Analysis of Musical Cultures’ in 2013 (University of Rome ‘La Sapienza’). He has carried out fieldwork in Sardinia and Cuba, and his main research interests are music and religion, musical performance, improvised poetry and rap, visual ethnomusicology. He is coordinating editor of the scientific journal Analitica – Rivista Online di Studi Musicali, and scientific director of the ‘Encyclopedia of Sardinian Music’. This paper presents some thoughts on my own 15-year experience in carrying out field research with audiovisual means. In the first part, I will retrace the paths that led me to include a camera in my fieldwork toolkit and to use video as one of my preferred ways for presenting the results of my research. In the second part I will propose a threefold division based on the different approaches I usually have with the audiovisual product: 1) video as raw material that supports the musical analysis; 2) video as the most effective media for presenting the results of ethnomusicological research; 3) video as the subject of analysis and theoretical speculation. For each of these three categories (and possible subcategories), I will discuss some examples using, footage from my own archive as a case study. In the third part I will present some theoretical issues concerning the relationship between the visual ethnomusicologist and the performing context, as well as the involvement of the musicians in the filmic project. At the end of my presentation I will project my last work, Santeros: a 67-minute documentary I made in 2014 focusing on the role music plays in Afrocuban religious culture. Nico Staiti is associate professor in ethnomusicology at the Department of Arts of the University of Bologna. He has conducted field research in southern Italy, Kosovo and Morocco. The lila – the domestic trance rituals dedicated in Morocco to the spirits’ possession – are not public. Often it is forbidden to attend, and almost always it is forbidden to take photographs and to record video. This is because spirits do not allow it. The research relationship we developed with some musicians and other actors of these rites is strongly orientated to the presence of video cameras, whose use strongly influence our research method and quality. The way in which these officiants of the rites justify to themselves, to the others and to us the fact that we are allowed to film and record is by saying that we are possessed by the spirit of cinema: this makes us pleasing to the spirit world. This idea allows to negotiate the relationship between the observer and the observed in a specific way. Terada Yoshitaka (PhD in ethnomusicology, University of Washington, 1992) is Professor of ethnomusicology in the Center for Cultural Resource Studies at the National Museum of Ethnology in Osaka, Japan. He specializes in music cultures of Asia and Asian America, and has conducted fieldwork in the India, Philippines, Cambodia, Japan and North America. Since 1999, he has produced ethnographic films on music from diverse locations, many of which deal with the music cultures of marginalized communities. He is currently the editor of Film/Video Review section of Yearbook for Traditional Music. In this presentation, I will reflect on the experiences of making films on music cultures of the minority populations in the Philippines, particularly that of Maranao people who live in the northwestern region of Mindanao Island. Maranaos are one of the largest ethnic groups with Islamic faith in the Philippines whose populations are predominantly Christians, and fought vehemently against foreign intruders including Spaniards, Americans and Japanese. Because their home region was never fully colonized, the Maranao maintain one of the very few pre-Hispanic performing arts traditions. Yet, the civil war and ensuing political instability since the 1970s has weakened the living performance tradition substantially. This situation has also made it difficult and dangerous to conduct research of any kind. In 2008, I went to Mindanao for a filming project with Usopay Cadar, who is a native master musician, US-trained ethnomusicologist and my teacher in the gong music form the region. I will begin my presentation by a short lecture to provide some background information on the subject, which is followed by the screening of the two films, which Cadar and I coproduced: Gong Music from Mindanao in the Southern Philippines (2011, 23 minutes) and Maranao Culture at Home and in Diaspora (2012, 35 minutes). Then I will discuss the challenges and restrictions that we faced in the field and what decisions we made to produce these films with the limited footage. Finally I will describe the potentials of audiovisual media for reinvigorating the tradition. Guido Nicolás Zingari (San José, Costa Rica, 1984) studied Literature, Philosophy, Art History and Cultural Anthropology between Lyon, Rome and Turin. He carried out numerous ethnographic fieldworks between Senegal and Togo respectively working on Sufi brotherhoods and voodoo cults, including in the framework of a PhD at the University of Turin still ongoing. Since 2012 collaborates with the collective of the Il Piccolo Cinema (Turin), mutual aid film society. The Sea (2014), winner of the Special Jury Prize at the 32nd Torino Film Festival, is his first short film. From 2014 to 2015 he worked as assistant director in the film River Memories of Gianluca and Massimiliano De Serio, produced by La Sarraz Pictures, presented at the 72nd Venice Film Festival and in the official competition of Visions du Réel (2016). The gates to heaven (2016) is his first feature film. The Qur’anic schools in the holy city of Touba, known as the Mecca of Western Africa, are home to thousands of young children and teenagers. Hassan and Pape, like all their peers, are called to learn by heart every word of the Qur’an and to accomplish farm works out in the fields of their spiritual fathers. Every day is a new challenge for them: the fear of God encounters the law of men, gradually fragmenting the ingenuity of their childhoods. In the long parable of this jihad of soul, they learn to pray, avoiding the violence of the world around them. In this arduous journey to the inner liberation, Hassan, Pape, and their young comrades are in quest of a secret that not everyone can access. Meanwhile, protecting the sacredness of each gesture, overcoming the injustices of life, imagining a path to the afterlife, are all tactics of a sole mission: facing the enigma of everyday life. The melodies of their songs and the taste of their desires take shape in an increasingly suspended and rarefied landscape.